The main point to realise is that all knowledge presents itself within a conceptual framework adapted to account for previous experience and that any such frame may prove too narrow to comprehend new experiences. Neils Bohr. I have tried to help advance digital media since their beginning well over 25 years ago ... with primary attention to the arts, academia, entertainment (formerly known as "Hollywood"), and the law. A Rare Target of Opportunity. About Year2K, I saw a rare target of opportunity. At that time, there emerged from scholars in Japan important theories about knowledge and digital media. Westerner popularizers and some scholars snatched without close study these theories, adopting them most importantly without attention to the cultural differences between Japan and the West. The Western popular and some scholarly adoption produced the field/fad called "Knowledge Management" ["KM"]. The aim of KM was and remains more important today than ever before: KM seeks to understand and optimize congruence between digital media and human thinkers. And, I felt and feel that the form of KM presented here, Liquid Knowledge, could make substantial positive contributions to the goal of KM. Unlocking the Benefits of KM: Liquid Knowledge. Liquid Knowledge redirects KM to that which is durable in theory and valuable in practice. Liquid Knowledge does so by shaping the philosophical foundations of KM. Eastern "KM", practiced in Japan, China, India, occurs in cultures where philosophy remains the foundation of all important areas of human endeavor. Liquid Knowledge is designed to provide for Western KM a comparable philosophical foundation. 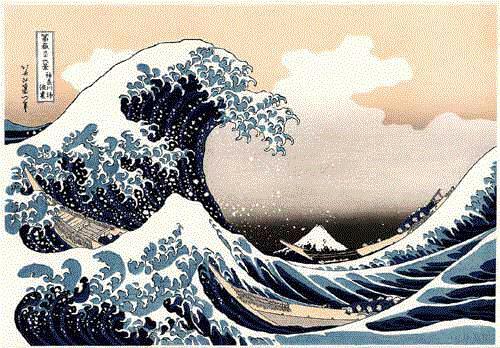 The most well-known work of the prolific Japanese painter, printmaker, illustrator and draftsman, and a fitting image for Liquid Knowledge and the modern struggles with the ocean of information and knowledge.